I would like to exchange insights about this issue with you. August 2015, Dr. Lock shared strange information. Some person found that James appeared on Facebook. At that time I and Dr. Lock exchanged some opinions, but I did not have clear insight about this issue. But today, finally an idea captured me. I assume some members of this forum have their opinions on this subject. Could you share your insight with me? Maybe that picture of James on facebook is photoshopped? Or then the black and white Sumbola picture was not his true face! Either or... Or something else... Maybe that is a stock photo? The same face appears on all those websites and even more... Maybe I hit bullseye with my guess: Stock photo. Or what do you and Dr.Lock think? Yes. This picture is a stock photo presumably. Although I did not tried to seek the original one, but I believe you understand that my presumption is correct if you checked the result by google image search. And of course, I and Dr. lock think that this person is not James himself. The true question is, why and who used this picture as James Mahu? Is there anyone who was trying to decode the meanings? Before I introduce mine, I would like to hear the collective intelligence of this forum. This is the challenge from the creator of WMM. Interesting...! As for who and why? Could it be James who thought that a stock photo would make for good anonymity, and that that particular expression resembled his close enough? To convey the mesage of divine love with a picture of a face, and especially the pencil sketch version gives a tad more "mystery" than the original stock photo! This is a stock photo according to the research some have done for a FaceBook page about this photo. Remember that James has used stock photos in the past. The one of 15 is a stock photo. It is a good question to ask at some point, if he didn't answer it all ready in the Qs & As in 2001-2003. Your insight is closer to mine. Actually, my first impression to this image is why he is smiling. Today, the reason is unknown to me, suddenly a face smiling emerged to mind. To put it briefly, IMO James’ image simply express that the creator of WMM is anonymous person. I guess that this image is chosen carefully by some points ; smile, male and mustache & beard. Who selected the image is unknown, but if my supposition is correct, this is stroke of genius. I don’t know the exactly reason of this issue, but I satisfied for some reasons. One. We know the person is not James himself. Two, We find a reasonable interpretation of this mystery. Do you think what the most important thing of the study of WMM is? Who is James is not matter. Please immerse yourself in WMM. Please remember impression when you find WMM first time. This image told me the most important thing. Thank you very much, James, the anonymous creator of WMM. Shima, it's very interesting, thank you for sharing it! At first glimpse I thought somebody found the real James, so keen to know. But then~ I found out the hand drawing picture we saw on Sumbola is actually not James! Yes it's ok, it doesn't matter of course, doesn't affect anything my learning from the materials. James still remain truly anonymous. but I also had a feeling being cheated! One thing is quite obvious: Why we wingmakers fans all assume that drawing is James without even question or checking on it?! Last edited by Luminousthings on Sun Apr 10, 2016 11:35 am, edited 1 time in total. If one says, “I am self-realized and therefore enlightened,” are they enlightened of the GSSC? Or, are they an experiencer of the Sovereign Integral state of consciousness beyond the HMS? If it is the latter, you will not find them on book tours, giving lectures, establishing schools or ashrams, speaking in the lecture circuits, creating a spiritual path, healing for money, profiteering from their experience, or claiming they have special powers that others lack. Mark Hempel and Ernest (Solaris of this forum) are co-founders of Sumbola so guess who put up that photo? Mark knows what James looks like he's had him as a guest in his home. Each can discern for themselves what it means to them if it means anything at all. James has also said in the Q&A of the WMM that the PTTB know who he is so they aren't much of a threat to him if my understanding is correct. Why he wants to remain anonymous when only a handful are really interested in these materials is no threat either. I suppose he has his reasons. Maybe it has something to do with his bloodlines, just a thought...could be the messiah thing he wants nothing to do with and can you blame him? Personally I think its because of his utter consistency in saying what he says about each individual applying these materials in their life as the individual they are and not expecting who offers them to do it for them or save them, is the crux of it. It's not the messenger, its what is offered for those who resonate as pre-planned and all being equal... Why couldn't that photo be James? 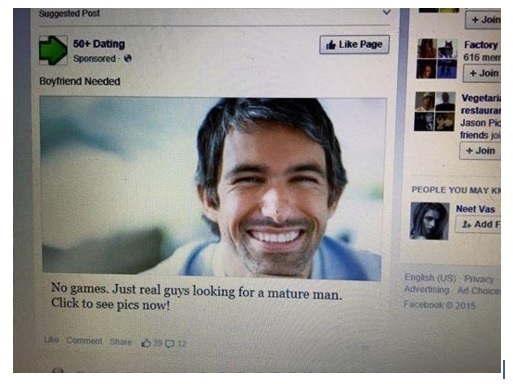 Because on that Facebook page its advertising for gays? Wherever that photo appears would make a great 'cover'. For how much he has prodigiously given and shown us I can see why time is so precious to him and how he can't afford to waste any of it, his mission is his life and everyone else's whose life he's touched with it. His real name isn't James Mahu either.